Here is a thumbnail sketch of Rachel Cusk’s Outline: a woman goes to Athens at the height of summer to teach a writing workshop following the end of her marriage. She meets a stream of people who tell her their stories. There is no plot, and no central conflict. In the hands of a lesser writer, the result might be, in one of the narrator’s favourite expressions, pure disaster. It is not. 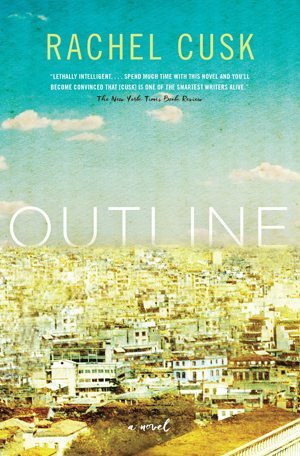 In fact, Outline is a brilliant, stealthily transgressive work, which enthralls on nearly every page. Spare and innovative in form, Outline is a finalist for both the Scotiabank Giller Prize and the Governor General’s Literary Awards, in a year with little overlap between the major prizes. The narrator is aloof, even recessive. We do not learn her name – Faye – until the final sliver of the book, underlining her ephemerality. Faye’s tone is shaded here and there with irony and bemusement, at times even a slight cruelty. Remarkably, Cusk achieves an explosive power within this reticence. Faye’s voice possesses an urgent, mesmerizing quality, as if she is speaking half aloud, half to herself. Outline is preoccupied with the faultlines between reality and illusion, intimacy and estrangement, shape and formlessness, known and unknown. In one of the book’s many powerful scenes, the narrator meets up with an old friend. They recall their last encounter, which included her husband and children. The friend was so struck by the happiness of Faye’s life that he took a photograph. Faye remarks, “He was observing something while I … was entirely immersed. … I did not notice that Paniotis went away … feeling that his life had been a failure, any more than the mountain notices the climber that loses his footing and falls down the ravine.” This scene recalls Virginia Woolf’s theme of the impossibility of truly knowing and connecting with another person; we so often misread other people’s lives through our own blind subjectivity. Just as an outline defines shape out of blank space, the voices of the people who pass through Faye’s life create colours and contour, a human collage. There are also some delightfully funny bits. Cusk remarked in a CBC interview on the unexpected pleasure of “finding the mechanism of the book, which involved some risks and experimentation, worked.” She achieves her goal of honouring “the strangeness of living” in a seamless blend of form and content.